The attacks on major publications and defence infrastructure are allegedly in response to Russia's actions in Ukraine. Rossiyskaya Gazeta editor-in-chief Vladislav Fronin said that the site was obviously the victim of a cyber attack. “There is no doubt that it was hacked. It was done by professionals who first messed around on the site, and then took down the server. They left their mark - Maydanovskaya sotnya (Maidan100),” Fronin said. 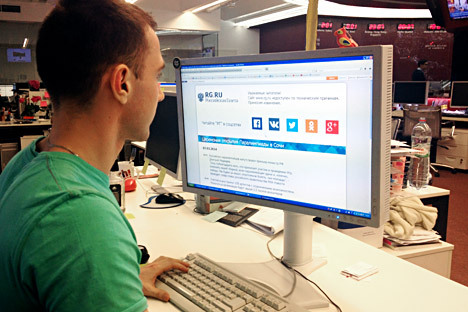 In Russia, the Information Security Centre (TsIB) of the FSB and the Bureau of Special Technical Measures (BSTM) of the Ministry of Interior Affairs are responsible for handling cyber threats. The TsIB fends off foreign intelligence services, extremists, and criminal organizations in cyberspace, and the BSTM mainly investigates computer crimes. Russian anti-virus company Kaspersky Labs, a global leader in cybersecurity, announced that it was investigating the attack at the request of Rossiyskaya Gazeta. This is the not the first instance of hack attacks on media associated with the Russian government. On Sunday, March 2 the website of TV channel RT was also attacked by cyber terrorists, who posted inflammatory headlines on the homepage. "They hacked the administrator's access. Control over the site has been restored," a spokesperson for the channel said. On March 6, the hacker group Anonymous posted documents online that allegedly disclosed the dealings of Russian arms exporter Rosoboronexport and announced a cyberwar against Russia's military industry, particularly those concerning Indo-Russian defence deals. The Hindustan Times reported that most of the leaked documents relate to India's dealings with Russia for the purchase, overhaul and repair of front-line fighter aircraft like the Sukhoi-30 MKI and the MiG-29. The paper said the documents included correspondence between United Aircraft Corporation, which makes the SU-30 and MiG-29 and the Hindustan Aeronautics Limited which manufactures the aircraft under license in India. India’s defence ministry and national security advisor were alerted after the breach was detected, the paper said, citing an official familiar with the development. “It is clear that our dependence on technology, as well as the enormous computing power of today's computers, have made us potentially vulnerable to attacks on very diverse targets. We have already seen Anonymous act in other countries. And, despite all the measures that have been taken, cyber attacks will most likely continue in the future,” Kamlyuk said. Ilya Sachkov, CEO of Group-IB, which specializes in cybercrimes, thinks that the hack attacks have already crossed the line into actual cyber warfare. But not all experts agree. “It is hardly appropriate to call it a cyberwar, in this case it is more likely hacktivism. This is a form of cyber attack used as a political or social protest. It is much easier to attack a government website or the media than to organize a real protest or demonstration. Hacktivists begin to be particularly active during tense political events. That is what we are seeing now, in light of what is happening in Ukraine,” said Kamlyuk.